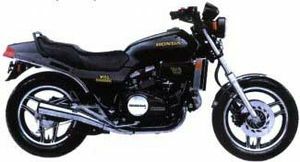 The Honda VF750S is a motorcycle produced by Honda from 1982 to 1983. 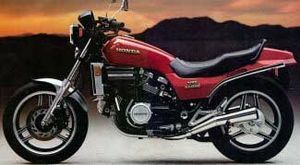 This is the bike that formed the foundation for Honda's line of interceptors. In 1983 it's engine was used a basis for the VF750F, which changed the world of sport motorcycles. Its engine was also used in the VF750C V45 Magna. The VF750S'82 V45 Sabre was sold in 1982 in one of two colors: Black or Candy Bourgogne Red. The front fender and exhaust system were chrome. The air cleaner cover had a silver "V-FOUR" decal. The speedometer had a 85 mph (135 kph) limit. The front disc brake grooves were straight. 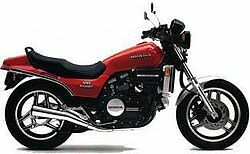 The engine was a 748cc 4-valve liquid-cooled V-4 linked to a 6-speed transmission and a shaft drive. The serial number began JH2RC070*CM000025. Available colors: Black or Candy Wineberry Red. The air cleaner cover "V4" decal was black with a white outline. The speedometer had a 150 mph (240 kph) limit. The front disc brake grooves were curved. The front fender and exhaust system were chrome. The serial number began JH2RC070*DM100006. The serial number began JH2RC070*EM100006.